Puget Sound’s ports are expected to grow rapidly in coming years, on pace with the region’s urban areas. More ships on the water could mean more accidents. Some management efforts can lessen the risk of a spill in Puget Sound. Lower speed limits for ships, more onboard monitoring, rescue tugs and double hull fuel tank protection are some of the options being proposed. But no efforts can eliminate the risk of all accidents. 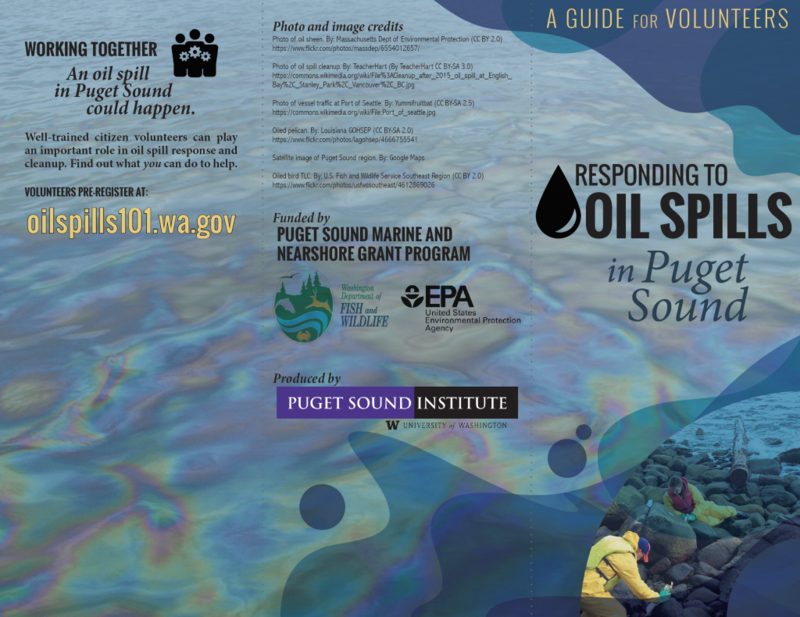 In 2017, the Puget Sound Institute on behalf of the Washington Department of Fish and Wildlife produced a quick guide listing some of the actions volunteers can take in the event of a spill. While response efforts are complex, one of the best things volunteers can do is to observe the extent of a spill and note the effects on wildlife. In some cases, volunteer observers for groups like the Coastal Observation and Seabird Survey Team (COASST) run by the University of Washington and the Puget Sound Seabird Surveys (PSSS) run by Seattle Audubon are already trained in oil spill observation. We invite you to read the guide which is now available on the Encyclopedia of Puget Sound.